My time in Almaty, Kazakhstan had reached its end, so on a sunny morning, I naturally purchased some Kazakh and Russian vodka for cheaper than I had paid for any meal during my Kazakh adventure, and hitch-hiked my way to the bus station. Slightly versed in the Cyrillic alphabet, I found my van parked in the back slowly filling with locals on their way to Bishkek, Kyrgyzstan. With not much space, I crammed into the back corner of the bus and braved what would be the four hour journey. The journey was smooth all the way through, and the landscapes looked weirdly Texan. I zoned in and out of a dazed sleep as I listened to music and minded my business. About ¾ of the way through, we took a bathroom break at a pretty run-down roadside stand. I got out and stretched and for the first time, took a full look at the other passengers. Turns out the man who was next to me, who I had merely grazed legs with a few times had a relatively attractive face, looking ethnically Russian and put together. I made eye contact with him for a brief moment before getting back on the bus and squeezing into my quaint corner. All hot and bothered, I stumbled out of the vehicle, adjusted myself, and made sure my passport was in hand as I approached Kyrgyzstan. The crossing was surprisingly effortless as I breathed heavily due to the nerves of entering a new country cross-pollinated with my newfound arousal. I walked into the brand new land in an emotional state that I never thought I would experience at a border crossing; but then again life is very strange and glorious. On the Kyrgyz side, we were only minutes from Bishkek, but we had somehow lost our mini-van in the midst of it. We both hopped into what looked like a taxi but was likely some random person’s car, and for the first time spoke to one another: him in Russian and me in English. It was then I decided that this would have to be one of those non-conversant relationships. I muttered the name of my hostel: fittingly the USSR Hostel, and we were on our way, loosely linking hands in the back seat. 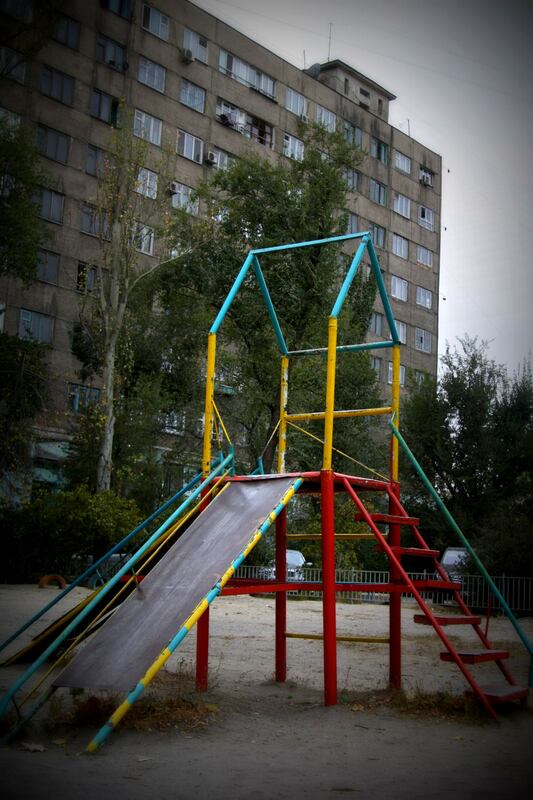 The hostel’s building was as bleak as the name suggests; situated on the 8th floor of a Soviet-esque style residential building with no elevator. 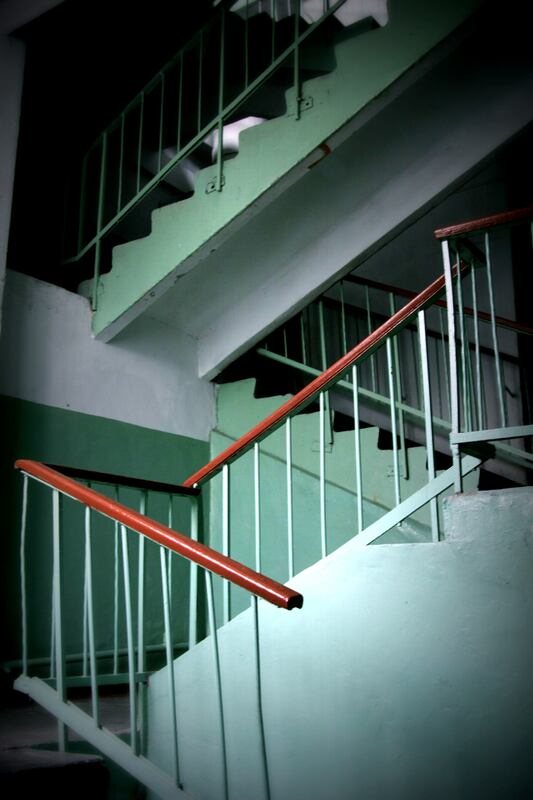 We climbed the hellish, dingy stairwell together, complete with rusting railings and the walls rocking a dilapidated layer of paint in the shade of dystopian-blue. Out of breath again, we reached the 8th floor and one of the most murderous looking doors to a hotel or hostel I had ever seen. It was then that I realized…this was a hostel and I had booked a dorm room with 8 other people. Somehow that didn’t stop us from proceeding, so we climbed one more set of stairs. Surrounded by utterly depressive and mood-killing aesthetics, we ignored it in a state of passion and after only five minutes, released the unyieldingly high built up tension from the van ride, marking our territory right there in the stairwell, and merely making our surroundings more sterile, if anything. The gorgeous stairwell where it all went down. Pants on, he helped me check in, and we descended the 8 stories again. Relaxed and hungry and non-conversant, we sat down in a booth and shared a sort-of, but not really romantic dinner of fatty horse meat and noodles (a famous Central Asian dish called, beshbarmak). After dinner, I muttered the one word of Russian that I knew, POKA, a casual way of saying goodbye in what was clearly a non-formal relationship. We then parted. Since that day, my border crossings have been much less eventful.